Sony is a renown mobile phone manufacture belonging to Japan. Xperia is the word that is the identity of Sony's phone. The company uses this word with almost every smart phone manufactured by it. It has diveded the phones into different categories with respect to their features and specifications. Sony uses english alphabest to denote the classification of its mobile phones like Xperia C , Xperia J, Xperia T etc. 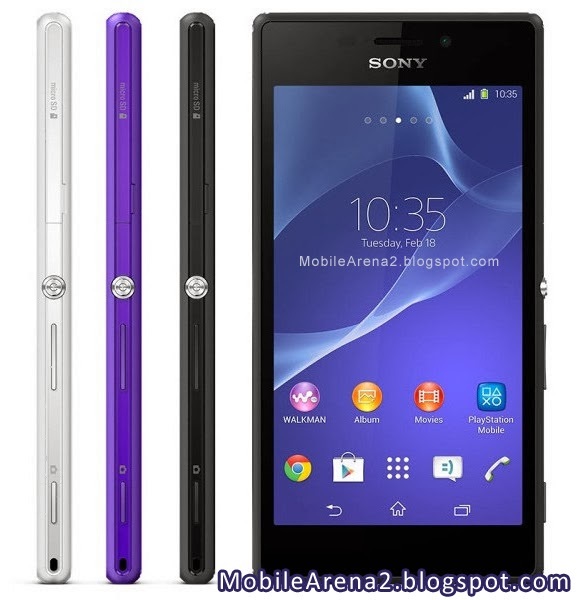 Xperia Z is the series for flagship models of the company. Xperia Z , Xperia Z1 and Xperia Z Ultra are the recently announced phone by the company. These models gained much fame among the technology lovers. Sony has announced three new models in the MWC 2014.Two of them are mobile phones while the third one is a tablet. 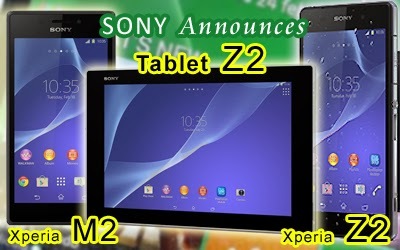 There are named as Xperia Z2 , Tablet Z2 and Xperia M2. Sony Xperia Z2 is new flagship model of the company. It has been the tradition of japanies mobile phone maker to present their smartphones with cuting-edge custom shapes and attractive features. This phone reveales to replace the critically-acclaimed and stunning Xperia Z1 that was the best mobile phone of last year. 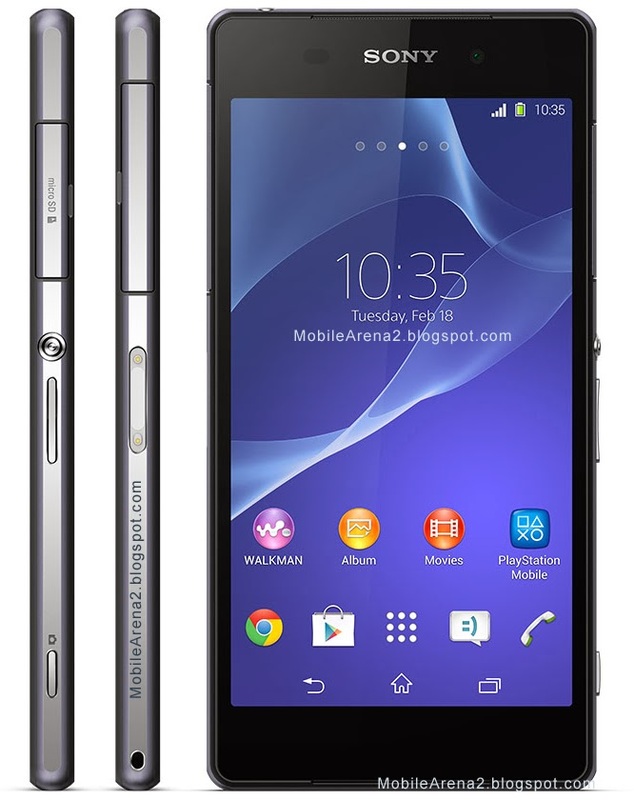 The Sony Xpera Z2 is the manufacturer's latest and greatest smartphone presentation. This phone is once again bringing some much-appreciated improvement in many fiesld and the notable thing is a huge enhancement in the screen department. All in all, Sony's latest flagship shapes up as a very beautiful offering - one that everyone want to hold in his hand. Sony Xperia Z2 is water and dust proof handset as its predecessor Xperia Z1. It is an IP58 certified hand set for being dust proof and water resistant over 1 meter and for 30 minutes. It has capacitive touch screen with 16M colors. Its pixel resolution is 1080x1920 that is very much effective to provides a terrific display result. It has 5.2" display with 424ppi value. As we noticed , the biggest improvement in this phone, compared to its predecessor Xperia Z1 is the display. No doubt, it has slightly larger display. it hass 5.2" instead of 5". Ladies and gents, this is glad to know that Sony has finally, finally put an IPS LCD display on its high-end smartphone! So, the Xperia Z2 has an IPS screen, and it is a big evolution. it is leaps and bounds better than the LCD screen of the Xperia Z1. Colors are so much more vivid and saturated - the difference really get quite striking once you check out both screens next to each other. Its body is Shatter proof and it has scratch-resistant glass over the Triluminos display. The display has X-Reality Engine baked by Sony which promises to add more delight in viewing experience. This phone has 163g weight. Sony has put all of its photographic experience in this phone . A 20.7 Mega Pixels camera is installed in the body of Xperia Z2. It can recrod videos of 2160p@30fps, 1080p@ 60fps and 720p @120fps. This phone has 2.3 Ghz Quad-Core processor which is slightly lower than Samsung Galaxy S5. This phone runs on Android 4.4.2 Kitkat right out of the box. It has non removeable 3200mAh battery which is very large battery to provide hours of entertainment. Its price in Pakistan Rupees is estimated in between 70,000 to 80,000 PKR. The second model announced by Sony in the MWC of this year is Xperia M2. Xperia M2 has 4.8 inch screen with 540x960 pixles. It gives a lower ppi value of only 229. So this phone can be called a mid-range phone. The news about the cause of presentaion of this phone is very interesting. They were saying that sony has made this phone to compete the popular Motorola Phone "Moto G". So the medium and average audience are the target of this phone. If we compare it with motorola Moto G , the Sony Xperia M2 is winner for a lot of reasons. It has an 8MP camera with an Exmor RS sensor and 1080p capture while Moto G has a 5MP camera that records 720p. The camera of Xperia Z2 also borrows the Background Defocus and Motiongraph features from the . The only down feature is the screen of this phone that is not upto the current standard. Sony Xperia M2 has one touch NFC feature. It has 8GB internal memory with 1GB of RAM. It also supported micro-SD card upto 32GB. It has 8.0 MP camera with auto focus facility and it records 1080p videos. It has 1.2 Ghz Quad-Core processor and it runs on Andorid 4.3 Jelly bean right of the box. Its 2300mAh battery promises more than 15 hours of talk time and about 10 days of standby. 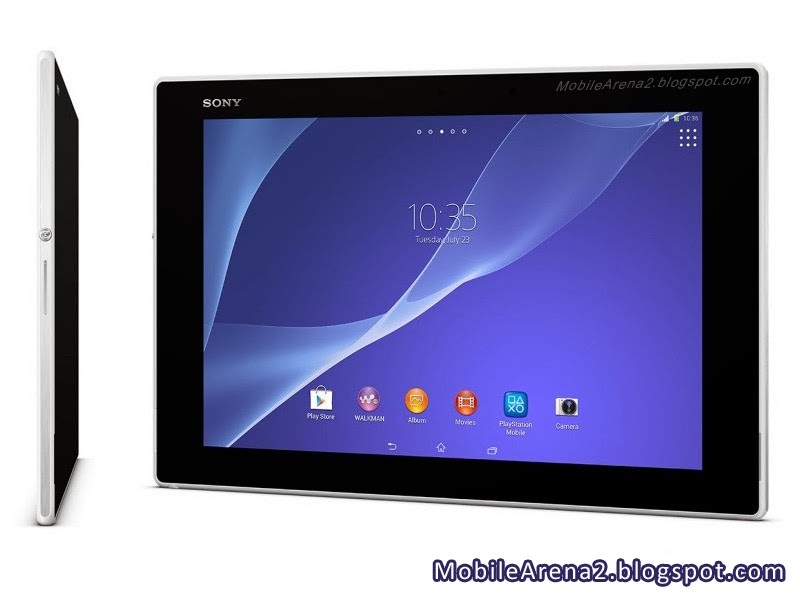 The Sony Tablet Z2 is the second Xperia tablet by the company.It is the successor of well known Tablet Z1. This tablet donot support Sim card. So it can only use on Wi-fi connection for internet and other data tranfer. Tablet Z2 has 10.1 inch display with 1200x1920 pixel resolution. Tablet Z2 is also IP58 certified tablet for its capability of being dust proof and water resistant over 1 meter and 30 minutes. You can use this piece of technology freely near a swiming pool or near any water reservoir. It has Shatter proof and scratch-resistant glass on its screen. Sony Mobile BRAVIA Engine 2 is another glaring fineness of this tablet. It has stereo speakers with 3D surround sound enhancement, so it can be used as a hi-fi sound system. It has two variants with respect to internal memory. It is available with 16 GB and 32GB internal memory versions. It has 8.1 Mega pixels auto focus camera that is capable to record 1080p @ 30fps. It also gives you HDR mood to enhance the image and video quality . It has the 2.3 Ghz Quad-Core processor as Xperia Z2 pared with Adreno 330 GPU. It has 6000mAh battery that is a surety for long usage without any headace. It will be available in black and white colors.